Sugarcane Raw Bar Grill (my thoughts here). 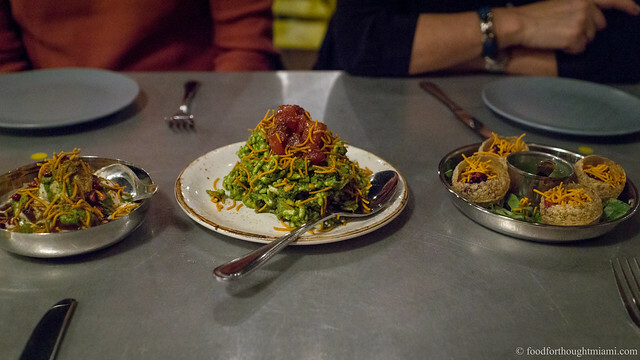 The unlikely but successful mix of tapas, robata grilled items, and sushi was recently named a semi-finalist for the James Beard Foundation "Best New Restaurant" award. The tapas items are generally the strongest part of the menu, with personal favorites including the bacon wrapped dates stuffed with linguica and manchego cheese, the flash-fried tripe with kimchi, the scallop crudo with apple, jalapeño, truffle and lime, and the duck and waffles. Sakaya Kitchen (my thoughts here). From the bare bones furnishings and counter-service layout, Sakaya Kitchen may look like a fast-food joint, but there's some real cooking going on here at this contemporary Asian place, with the best pork buns in town (slow-roasted shoulder topped with pickled cucumbers and spicy-sweet ssamjang sauce), great Korean fried chicken, honey-orange glazed ribs that you'll eat like candy, and the awe-inspiring "bulgogi" burger. Sustain (my thoughts here). This recently opened restaurant puts its money where its mouth is, doing farm-to-table Florida style. Some highlights include the "50-Mile Salad" (with ingredients all sourced from within fifty miles of the restaurant, including Paradise Farms brassicas, roasted beets, local heirloom tomatoes, pickled onions and fromage blanc from a local producer), the intensely-flavored Florida corn bisque, and the "Fork and Knife" Burger using Four Arrows Ranch grass-fed beef. Gigi (my thoughts here). Just across the street from the Midtown Miami complex, Chef Jeff McInnis is packing them in nightly with a mix of contemporary Asian (the trend du jour in South Florida) and local flavors. Some of the best things on the fairly short menu are the "BLT" (with pork belly in a toasted Chinese bun and pungent pickles), the short rib meat loaf with a smoky plantain purée and salty-sweet soy molasses drizzle, the beef brisket buns, the crispy chicken skin with an Asian romesco sauce, and the grilled butternut squash with yogurt and a spicy vinegar drizzle. Bonus points for being open late: 3am on weeknights, 5am weekends. Miami was a bit behind the curve on the food truck trend, but is trying to catch up quickly. A year ago there were only two. Now there are more than forty on the road or in the pipeline. The good news is that they often congregate, and your best chances to catch several of them in one place may be at the Biscayne Triangle Truck Roundup on Thursday at the American Legion Hall just east of 64th Street off Biscayne Boulevard, or the Wynwood Food Truckers Meet Up on Saturday night at 210 NW 22nd Lane. Some may also be at Grove Harbour Marina for Thursday lunch. You might see the gastroPod, plus Sakaya Kitchen goes mobile with the "Dim Ssam a Gogo" truck, but also keep an eye out for Latin Burger (get the "Macho Burger" with some chorizo in the grind, and topped with Oaxaca cheese and grilled onions), Fish Box (the pan con minuta is a great fried fish sandwich), Jefe's Original (go for the Ensenada style fish tacos), The MexZican for tortas, and some desserts from Sugar Rush or frozen concoctions from Feverish. Schedules and locations change frequently, a good place to check is Burger Beast's SFL Street Food Locations, or my twitter list of Miami Food Trucks. So if you're doing the South Beach Wine and Food Festival thing, please enjoy. But if you want to sample a little more Miami flavor, I'd encourage you to get out of the tent and do some exploring. Check out pics from this weekend's SOBEfest from fellow foodie @BillyDec. Tons of pics of food! As well as Paula Deen, Anthony Bourdain, and Andrew Zimmerman! Be sure to follow him too and see pics of food from all his travels! He's currently on a food tour in NYC!